Another wedding photo this week for Sepia Saturday. I have lots of them because I inherited these two adorable "mother-of-the-bride" albums from my Nana. She kept these this beautiful collection of photos of her daughters in an antique dresser in her bedroom. They were in a little box the corner of the bottom drawer under some pretty linens. I can still picture it. I used to have sleep overs at her apartment on Friday nights when I was young...probably until I was about 10 years old or so. I used to look forward to these nights all week. Besides spending time with Nana and Pops, I knew I would get to eat homemade pizza, play cards with her girlfriends around her tiny kitchen table, and look at the wedding photos from my Mom's and Aunt Connie's weddings right before bed. I can't tell you how many times I made my Nana look through those albums with me. 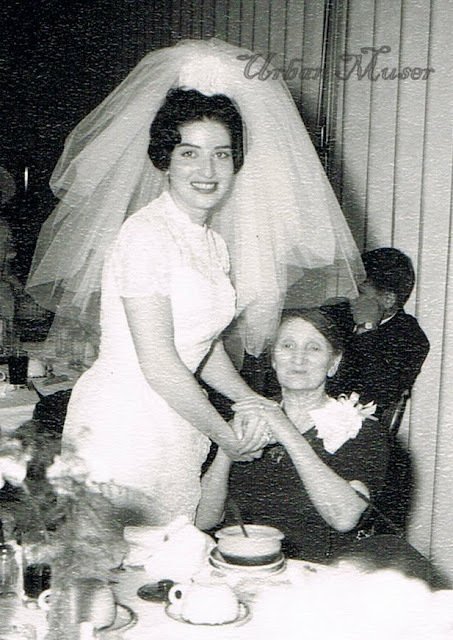 Here is my Mom (the bride) with her maternal grandmother (Nana's mother, Carmella Ferrara, nee Savriano). This photo was taken in Montclair, NJ in May 1963. Love the veil. Almost like a water fountain. She looks lovely. And like the guy in the background hoping to not be in the photo. Gorgeous photo! What a beautiful shot. What a beautiful bride and she looks so happy! I agree, I love the veil, too. What year was this? Hi Gibknitty, wedding photos are always fun to see. Your Mom was a beautiful bride. It is lovely that you have such nice memories staying with your grandparents. there is always somebody in the family who likes to take over the family history and photos. Otherwise everything will be lost. WHat a beautiful photo - I wonder if our great grandchildren will do this with our pictures one day. Your mother is lovely! And how proud her grandmother looks! She was a beautiful, and happy bride. Your Great Nana looks to be very proud also. Mom is absolutely gorgeous! Montclair, New Jersey eh? My dad grew up in Bloomfield. One of my fondest memories was of him taking me to the Bloomfield/Montclair football game on Thanksgiving! Beautiful photo! Beautiful bride! I love looking back at old photos! Your mother was such a beautiful bride and I loved the story of your sleep overs, I think memories like these are so valuable. Many thanks for visiting my blog and your lovely comments. Wedding photos can often be so stiff and formal but this one is natural and full of life. A captured moment if ever there was one. I see similarity in their faces. How lucky to have these albums and to have such great memories to accompany them. She really is a very happy bride! Glowing/. My grandmother gave me the MOTB book from my folk's wedding. A lovely treasure. a lovely jersey bride. i suspect this was not taken by the official photographer but perhaps by a relative/guest, for its casualness. a joyous day for both women, assuredly. i deleted the previous comment because, for once!! !, i saw a typo and wanted to correct it to avoid confusion... blame it on my dyslexia. Your mom was a beautiful bride. What a treasure to have a photograph of her with her grandmother with their hands entwined. Lovely photo, lovely memories of the sleepovers with your grandmother. That is such a beautiful memory. I love it so much. My grandmas were some of the most beautiful women I have ever encountered. I miss them both every day.